The procedure is called "Chasen Nasu". Nasu is eggplant. Chasen is a bamboo whisk for traditional Japanese tea ceremony called "sado". It is so named because they look similar. The image on the left shows the directions. 1. Use small eggplant. Put knife at the stem end, turn around, and make an incision around the stem end. 2. Remove the stem part by hand. 3. 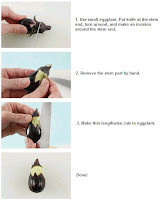 Make thin lengthwise cuts in eggplant. * Pictures are from tepore. By the way, there are many other traditional ways to cut and peel ingredients in Japanese cooking! This site shows some examples. Today, the gym is closed, so I am thinking of going out for a dinner with my boyfriend! Believe it or not, I go to the gym every day for an hour!! !